A quick word before you look at the numbers. The prices below are for a brand new copy of Studio Manager 17 for owners of a previous version. Prices do not include the cost of upgrading FileMaker Pro or FileMaker Server or subscribing to the FileMaker Cloud service from AWS. Our upgrade price list also does not include the cost of extra computer help you may want to import your data or transfer your customizations into Studio Manager 17. We don’t bundle and thus don’t charge higher prices for these optional services because many of our customers have their own in-house or local expertise to handle the importing and customization themselves. See the price tables below for good information on upgrading, including a description of the upgrader guide that we have written to help you along your way. Upgrade Price Example: Let’s say you have a single-user version of Studio Manager. The current discounted price of Studio Manager 17 for 1 user is $695. If you are upgrading from anywhere between Studio Manager 7 thru 11, your price is in column 3, $417, which is 40% off after many years of use. See below for the full upgrade pricing breakdown. If you don’t see your user count in this list, drop us an email and/or text or call 415 789-5219 and we will give you a quote. We can quote you all the way up to our unlimited license that is $9,995 and lets you go way above the 40 users listed here. Your volume discount gets better and better as you go higher. We give you a checklist. When you upgrade a customizable product like Studio Manager, you get the full new product and then need to (1) import your data into it and (2) re-create any customizations you may have made in the past that you think are worth adding. Easiest Upgrade. You don’t have any conversion to do. You can simply import your data from your version of Studio Manager (12, 13, 14, 15 or 16), table by table. See the upgrade from 7 – 11 to 17 and skip the part about converting your file first. Set all the auto-number fields like estimate numbers and invoice numbers so that they start where your old version of Studio Manager leaves off. Copy and paste your pop-down lists if you have changed the generic versions. There are about 10 that tend to be customized. Double check and compare various totals to make sure they match your old numbers. If you’ve made a lot of neat customizations, maybe some special reports, you’ll need to create new layouts and copy and paste from your old file to get them back. if you’ve done some extra scripting, you will need to copy those scripts over and make sure they tie in with current layout names and such. Upgraders Guide. We have a special upgrader’s guide to the import process that walks you through the steps. Feel free to call or email if you have any concerns about this. We are here to help. We offer importing and conversion services too (see below). Keep reading, the next big section on the Upgrade Process applies to you too. Converting your files twice. To move your old data in Studio Manager 4 or less, you need to first open your files in FileMaker 7-11 (among these, FileMaker Pro 11 has the most powerful conversion capability). Then you need to open the converted files again in FileMaker Pro 17. Then you import them into the appropriate tables in Studio Manager 17 matching fields as you go (see below). When you upgrade, we include a table by table guide/checklist to walk you through importing. As you go through the import process, depending on how old your current version of Studio Manager is, you’ll be making more or less adjustments to field matching as you import. If you don’t quite get a particular import right the first time, you can do it over again. FileMaker 17 will remember the first import order you just ran and you can delete the data you just imported and reimport starting from the matching of fields you just did, not from scratch. Also, you can compare totals in many cases and see if your SM17 totals agree with your older SM totals. They should. Consult us if you have questions. We give you a free hour of support for SM17 and this may be a very good way to use it. More time is available to you for purchase in 10 minute increments (see below). We Offer Upgrade Services. If you have less time than money at the moment or you just don’t like this kind of thing, we would love to do your upgrade for you. An average upgrade charge is around $800. A major advantage of having Tokerud Consulting Group perform your upgrades is that we check your files and data as we go along and fix what we can or flag it for you to fix. It’s a kind of data quality audit. The cost for upgrading depends on two things: (1) how much data you have (larger firms with years of data take longer than small firms or those with only a year or two of data) and (2) do you want us to re-do some of your customizing. Or, you can start from scratch with Studio Manager 17. Enter or import your new clients, set-up or import your billing codes and enter your current jobs. The advantage here is threefold: (1) You know you haven’t imported in old bad data that may have suffered crashes from power outages for example, (2) you acquire a full archive, (3) the new, smaller file runs really fast and (4) you save a bunch of time/hassle/money by not having to import the data. You still will want to make customizations like the most common – make the generic invoice look the way you want. But then, that’s what you are best at and most comfortable with. As usual, you can use us to back you up if you have questions or want assistance. FileMaker 17 has gotten much much better in its design tools, and you may have little trouble making tweaks without our assistance. Also, we love to answer your quick questions (see our 10-minute increment billing option made exactly for when you are stuck and want a quick answer). If you start over, keep your old copy of Studio Manager and FileMaker to use as needed for reference or analysis purposes. Import tables. If you added extra tables for custom functionality, you can import them into Studio Manager 17 and then just repoint any relationships. Copy and Paste fields. You can highlight fields and copy, then go to the new corresponding table and paste them into place. Copy and paste layout objects. Just make sure that the part dimensions are set the way your favorite layout’s parts are set using the Size windoid and then copy and paste the whole set of fields and logos from your old layout to your new one. Copy and paste scripts. Now you can copy and paste scripts you’ve created in your now “old” version of Studio Manager into Studio Manager 17. We recommend that, when you upgrade, you take the opportunity to review your customizations and only re-implement the good stuff. Then make them better based on your experience using them and based on the latest features in FileMaker Pro. Having to re-do software is often the best problem to have because you get to take a fresh start at it based on what you’ve learned in the meantime. Most seemingly good ideas don’t stand up to the test of time or are needed for a single one-time thing. Trim your sails a bit, but don’t forget to tweak and add some conditional formatting, edit button icons and button bars, use hex colors to take our good colors to your great ones that match your business identity. Most of this is simple data entry or copy and paste. FileMaker Pro 17 Advanced is a powerful resource for your shop and it has become the replacement for FileMaker Pro 17. With it you can more quickly copy and paste fields, scripts and script steps. It also lets you do higher level things like run a powerful script debugger and add custom functions (many of which are freely available on Developer sites). If you only want more advanced users to have access to these developer tools, don’t worry. FileMaker Pro 17 Advanced comes with the Advanced features turned off in preferences, so they can be consciously turned on for particular users. FileMaker Pro 17 Advanced will serve you well if you’ve done a fair amount of customizing and now want to re-implement the changes that worked well in your previous version. You can read more about it on FileMaker’s website. Because it can do some advanced tricks, FileMaker Pro Advanced gives you a special kind of insurance policy. Even if you don’t use it yourself, you could use it under the telephone or email supervision of Tokerud Consulting or of a local consultant who is not able to come into your office as quick as you need them. It makes our job easier, you get your needs met faster and it’s affordable. If you have one or more in-house FileMaker fans, they’ll love this. SM15 – Dec 2016. FileMaker 15 tweaks the UI tools we used in SM14 and 14.5. So we kept going and further refined object states (like hover, press and active), Button Bars and FileMaker Styles in 15. SM15 further streamlines Studio Manager scripting and layouts to make sure performance is excellent. Our trusty fine tooth comb earned its place in our toolkit once again. If you haven’t upgraded in a while, especially, you are going to love this! SM14.5 – Dec 2015. FileMaker 14 supports object states, SVG graphics, is streamlined for speed and new cool button bars that make it much easier to handle groups of buttons like we have in Studio Manager. So we took advantage of all that and went through the 400 layouts that makeup Studio Manager and made them better. The final result is a more responsive, faster tool that will engage your users and yourself. It never hurts for your mission-critical application to be appealing and fun to use. SM14 – July 2015. FileMaker Pro 14 had a bunch of new technologies and actually a few special requirements. This early release of Studio Manager both requires FileMaker Pro 14 and FileMaker Go 14 and handles all 14 requirements. In addition, we refined the custom FileMaker CSS theme throughout. SM13 – August 2014. FileMaker Pro 13 was primarily a better-looking and easier to use version of Studio Manager 12. It uses Avenir Next Condensed throughout which provides more information and more white space — a good thing in a full-featured mission critical app. We used the better tools in FileMaker Pro 13 to create custom themes which first became possible in this release. SM12 – December 2012. FileMaker Pro 12 introduced an entire new file system with this huge release that made FileMaker much better able to run from iPhones and iPads and also introduced much better tools for design. We took the opportunity to use the new design tools and redo the look of Studio Manager 12. However, FileMaker 13 upped the UI design ante by giving us much more control over the CSS under the hood so now with Studio Manager 13, we are way happier with the look than we got here in SM12. SM11 – January 2011. FileMaker surprised us with the quick release of FileMaker Pro 11. We scrambled to update Studio Manager to match. The most important upgrade for both was the addition of the ability to link with Apple mobile devices via a brand new app: FileMaker Go. We added layouts to include the iPad and iPhone/iPod touch. When we discovered that FileMaker Go would not support the SM10 Job Assignments function, we changed the default in Studio Manager 10 that meant that this process was required – it is now an option. Addendum to SM11: Assigning Tasks is Not Required. Click this link to open a PDF of the addendum. Depending upon how your browser is configured you may choose to open the file or to save it. Added on 7/11/11. SM10 – November 2009. This was a major upgrade for Studio Manager in which we completed reformatting of all layouts to the new widescreen form factor. Added summary tabs to Contacts and Jobs. Added FileMaker 10’s Quick Find feature to Contacts. Created the Employee Dashboard, including a new mini-timesheet, to make the Employee tab in Contacts a central starting place for each employee. Added a Calendar with month and week views. Introduced Job Assignments and made doing so mandatory without customization. Added the ability to track time by task and to slip blocks of tasks to alternate dates. Revised the invoice to allow for easy non-graphics-professional personalization. Added email and Mail Log to Jobs. Introduced enhanced billing control by allowing a “hold” to be placed on certain items. A detailed review of Studio Manager 10 new features is included in the Studio Manager 11 User Manual.The SM10 link is to a PDF of the file Studio Manager 10 New Features Guide. Depending upon how your browser is configured you may choose to open the file or to save it. Added on 7/11/11. SM 9.2 – February 2009. Resized all the Studio Manager screens to better take advantage of FileMaker 10’s new customizable toolbar at the top of the screen and added table views to over 15 tables including all the main ones. FileMaker Pro 10 introduced subheads and subtotaling on-the-fly without having to preview. So Studio Manager table views (a spreadsheet-like list view) have colorized headings and subtotals so you can browse and experiment with different views interactively. Very valuable new capability. SM 9.1 – December 2008. More than a point 1 release but FileMaker 10 hadn’t come out yet, so we didn’t want to call it Studio Manager 10. Added Google Maps in contacts to see where people are and get directions. Four new time and expense reports. Introduced Taxable Estimates as an option. Beefed up summary and flat fee estimate capabilities. Added a report that shows security information settings. 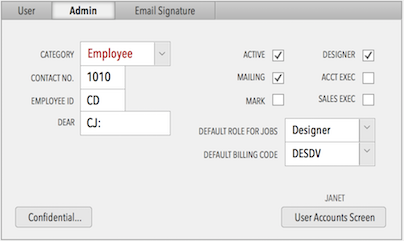 In January when FileMaker 10 came out unexpectedly (they had never done a release in January), we added FileMaker 10 compatibility and used the new script triggers feature to make clicking on Contacts tabs also filter by type of Contact. SM 9.0 – November 2007. You need FileMaker Pro 9 or 10 to run Studio Manager 9. SM9 takes advantage of FileMaker Pro 9’s great new Conditional Formatting and adds a range of other features to Studio Manager 8. We now have 4 views of an employees tasks (today, overdue, 3-day and all) plus color coding the tasks via FileMaker 9’s conditional formatting. We have a built in clean-up facility for new contacts or editing contacts which will take data copied in from the web or other stylized text and clear the styles, size and color so that FileMaker formatting will apply correctly. You can now click a button to save contacts to the Mac Address Book and create vCards. Check out what is new SM9 with lots of screenshots and more detail on what is included in this upgrade. SM 8.0 – November 2006. The biggest improvement by far is the new user interface makeover throughout and the simplification and streamlining that went along with it. There are a great many refinements. We are especially proud of the fuller-featured 4-Week Schedule Reporting capability which will help your scheduling immensely. SM 7.5 thru 7.7 – Nov 2005 to July 2006. See our special pages on new features for 7.5, 7.6 and 7.7. You can link to these pages from the SM News Archives. SM 7.0 March 2005. Mega upgrade! We’ve updated our whole set of screenshots and descriptions so that they describe our Studio Manager 7.0 product. When we did so, most of what was said was still valid. We’ve added a report here and there but the bigest improvement is that Studio Manager 7.0 is a single file. It still holds all the different data inside that file as separate tables but the feeling and file management changes much for the better. We increased the screen sizes by 69% across the board. In fact the screen footprint stays constant which is another one of those feeling things that makes a lot of difference. Try the free demo to get the new feeling. SM 4.6 March 2004. You heard it here first. Besides smoothing out a couple rough edges in SM 4.5, we’ve added new features to the sales and marketing functions in SM 4.5. Also, we added a feature to invoicing – when you make a new invoice for all your unbilled actuals, you have a new choice of expenses only. SM 4.5 December 03. We made a major upgrade to the marketing and sales support in the contact management portion of Studio Manager. There’s a real sales to do list built into this upgrade. More Info. SM 4.4 – September 03 Practice makes perfect. We added more features and capabilities to the security capabilities of Studio Manager based on customer feedback and our own new ideas. More Info. SM 4.3 – June 03. Practice makes perfect. We added more features and capabilities to the security capabilities of Studio Manager based on customer feedback and our own new ideas. More Info. SM 4.2 – March 03. We got into the password and security business with this upgrade. We created three tracking files to help you keep track of who could do what where in Studio Manager. We installed four levels of passwords and groups from the lowliest staff person to the owner and master programmer. More Info. SM 4.1 – August 02. Converted master version to FMP 5 (up till 4.1, we created parallel versions of Studio Manager – one for FM 3/4 and one for FM 5-6. Expanded the billing and markup rates in Studio Manager. We went from 4 hourly rates to 8 and from 2 markup rates to 4. This increase the number of rates gave more flexibility to larger firms and firms that do lots of different things.Used object emboss tool available in FMP5 on objects and eliminated a second offset box graphic to create the effect the hard way – making layout work much easier.